Chesapeake Utilities Corporation is a diversified energy company that provides superior service to its customers and communities. I am very pleased to report to you that 2017 was the 11th straight year of record earnings for Chesapeake Utilities Corporation. Total shareholder return, including stock price appreciation and dividends, was 19 percent for 2017, bringing our compound annual shareholder return to 24 percent over the past five years. We provide more detail on our financial gains elsewhere in this report and in the accompanying Form 10-K for 2017. The federal Tax Cuts and Jobs Act (“TCJA”) is providing benefits to our Company, primarily our unregulated businesses. The TCJA impact on our 2017 earnings was $0.87 per share, due to a $14.3 million noncash benefit from revaluation of net deferred tax assets and liabilities associated with our unregulated businesses. These 2017 TCJA benefits resulted from our robust capital investment opportunities driven by our strategy and developed by our engaged employees over the past five years, bonus depreciation available under pre-TCJA tax law, and the treatment of deferred tax assets and liabilities provided by the TCJA. Looking forward, the TCJA reduction in the corporate income tax rate, beginning in 2018, will benefit our unregulated business strategy and increase our earnings per share. The income tax rate reduction and the utilization of 100 percent expensing of capital expenditures for our unregulated businesses’ strategy are expected to stimulate additional growth by reducing our capital costs. We, as a Company, went through a disciplined process to identify what distinguishes Chesapeake wherever we are doing business. We asked ourselves: Why have we been successful? How do we continue this success? We conducted research, analyzed the results and launched strategic discussions to see if we could reach consensus on the values and attributes that make us who we are. We turn aspirations into reality every day. We personally and genuinely care about each other, our customers, the communities we serve, our investors, and our business partners. We emerged from our 2011 companywide process with a powerful consensus that aspiring and caring define who we are. We also knew that aspiring and caring had been at the heart of our success before we identified them as such in 2011, and they have energized our success even more since then. These values are symbolized by the soaring aspiring and caring bird that first appeared in our 2011 Annual Report and has become more prominent throughout our business and in every annual report since then. On the cover of this year’s report, the aspiring and caring bird soars like a burning star in a midnight blue sky, leading us, energized, onward and upward. Ideals energize top performance in any organization. Consistently trying to live up to our ideals of aspiring and caring has made us a better and stronger Company. Look at the map at the front of this year’s report, depicting the U.S. from the Mississippi eastward to the Atlantic, showing Chesapeake’s growth far beyond our initial footprints on the Delmarva Peninsula 70 years ago and in Florida 32 years ago. Since 2011, we have actively grown our operations in those areas and expanded into Ohio, Pennsylvania, Virginia, and West Virginia, including cities such as Fernandina Beach and Pensacola, Florida; Baltimore and Ocean City, Maryland; Columbus, Ohio; and Philadelphia and Pittsburgh, Pennsylvania. As we look forward to 2018 and beyond, we are truly energized by the prospects that we see ahead for us. We continue to identify opportunities to expand our regulated and unregulated service offerings within and beyond our current markets. In all that we do, our employees’ commitment and dedication are at the heart of our success. Their care for our customers, our communities and each other strengthens all of our relationships. Their caring and aspiring account for our Top Workplace awards for each of the past six years as well as the other 2017 awards and honors described in this report. We were also honored to see the results of a survey we conducted in 2017 that focused on our top 25 institutional investors. We found that they have very favorable opinions of Chesapeake, our team, corporate strategy and execution, financial and operating performance, and future growth plans and objectives. They most frequently cited our track record of identifying strategic opportunities and producing superior total returns driven by earnings and dividend growth as factors that differentiate Chesapeake from our peers. This is a result of our excellent team and a culture that values both capital discipline and entrepreneurship. Such shareholder support energizes the aspiring and caring bird to soar even higher. We are driven every day to find creative and innovative ways to serve our customers and attract more, while honoring our obligations to operate in a safe and environmentally responsible manner and to provide you a competitive return on your investment in us. We stand by that commitment today, as we did in 2011. I say to you now, as I said then: Thank you for your continuing confidence in us. 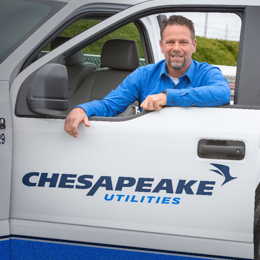 Our employees are the energy that drives Chesapeake Utilities Corporation. Their commitment to our customers, communities and each other energizes the Company and helps us achieve sustainable growth. Our employees strive to build meaningful connections that generate opportunities to grow our businesses, develop new markets, and enrich the communities in which we live, work and serve. The Company’s propane distribution business experienced significant growth in their retail and wholesale operations. Sharp Energy grew its AutoGas business, which included a new operations and fueling station in Maryland. 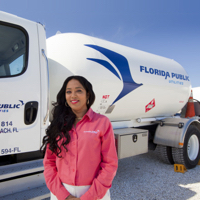 FPU expanded its propane services by acquiring two small distribution businesses in Florida. Our employees led the Company to Top Workplace recognition in 2017, marking the sixth consecutive year we received this honor. A third-party survey showed that nine out of 10 Chesapeake employees surveyed said that they would highly recommend working for the Company. Employees highlighted Chesapeake’s strong values and ethics; confidence in the direction of the Company; the feeling of being a part of something meaningful; and the genuine appreciation they receive for their efforts. Our employees are the engines driving our strategic growth. Energized to go the extra mile, our employees deliver safe and outstanding service while identifying innovative solutions that meet the energy needs of our customers and communities, and achieve long-term growth for our Company. Pictured clockwise from top: Sergio Carrillo, Director, Corporate Development; Amy Snyder, Manager of Origination; and Brian Goff, Manager, Environmental Projects, engage and exchange ideas to help energize our Company. Our employees energize the Company and our growth. The results of our most recent Top Workplace survey showed that our employee engagement level is twice that of average U.S. workplaces. Pictured left to right: Nicole Durham, Treasury Analyst II; Tiffany Palmer, Manager, Business Unit Accounting; and Dan Massengill, Manager, Financial Analysis and Services, participating in the Company’s Aspiring Leaders Academy. We care about the communities where we live, work and serve. 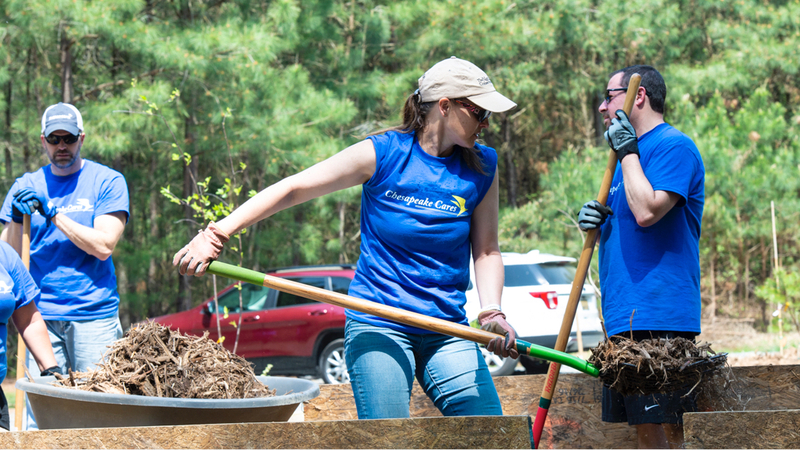 Our employees are committed to making personal connections and giving back in meaningful ways. 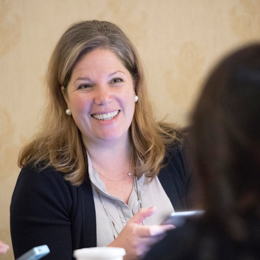 Amy Snyder, Manager of Origination, mentors students at Junior Achievement of Delaware. Our environmental commitment extends beyond compliance as we remain dedicated to sustainable, environmental stewardship through more efficient energy use and conducting business with environmental responsibility. 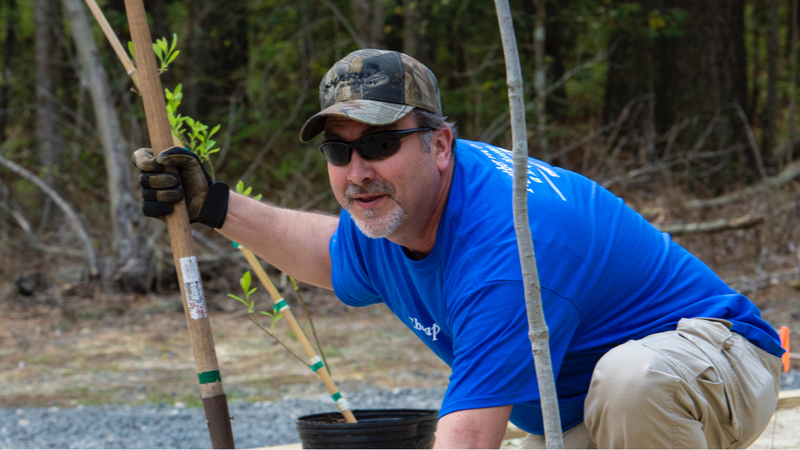 Through volunteer efforts and sponsorships, Chesapeake has partnered with the Delaware Chapter of The Nature Conservancy in support of conservation and protection of natural resources in Delaware. Pictured, left to right: Joel Hermogenes, Corrosion and Leak Specialist; Anthony Lugo, Measurement Technician; Kevin Jones, Bulk Plant Construction Manager; and Richard Cleveland, District Gas Operations Manager, joined Chesapeake volunteers and the Delaware Chapter of The Nature Conservancy at the Milford Neck Nature Preserve in Delaware. The energy and heart that our employees demonstrate in executing our strategy are what helps the Company turn aspirations into reality, year after year. Their efforts have resulted in the disciplined expansion of our service area and capacity across the Company. Mike Bates, Compressor Technician I, at the site of the new ESNG 3,550 horsepower compressor station in Delaware City, DE, that will increase transportation services to customers. As we stated in our 2014 Annual Report, our strategy and strategic planning process have served us well and positioned us for future growth. We have grown our businesses at rates higher than the national averages for utilities. Nevertheless, we are not resting on our laurels; rather we continue to be committed to looking for opportunities beyond our existing service territories and existing offerings. Our growth in 2017 as well as the 10 prior years is evidence of the commitment, talent and creativity that our employees use to energize our Company, customers, investors and communities. Our ongoing engagement efforts will infuse employees with a shared set of values: to personally care about each other, our customers, communities and investors, and to strive to turn aspirations into reality. These engaged and empowered people are emboldened to look for new ways to meet the needs of our customers, grow our businesses and make a meaningful impact on our communities. We will continue to expand our service offerings and further expand our presence as the provider of choice. We are committed to tailoring our energy plans to meet the unique needs of customers through increased capacity and the availability of natural gas and propane via our infrastructure, environmentally cleaner transportation fuels and technologies that increase reliability and resiliency. As we continue to expand our service territories and bring natural gas and propane energy solutions to new areas, we will also identify future opportunities by weighing the financial performance with the cultural and strategic fit to our business mix. Through our thorough and disciplined Growth Council review and approval process, we are committed to generating the right strategic opportunities for our long-term growth while increasing shareholder value. Dover Gas Light Company, a gas company located in Dover, DE, was started. 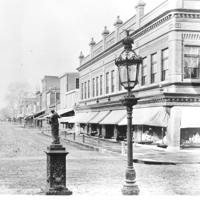 Dover Gas Light would eventually become Chesapeake Utilities Corporation. At Chesapeake, we recognize employee and business milestones, welcome new team members and offer a forum for peer-to-peer recognition at Chesapeake Cares Events. A team of Brand Champions organizes these events throughout the Company to encourage team building and camaraderie among co-workers. 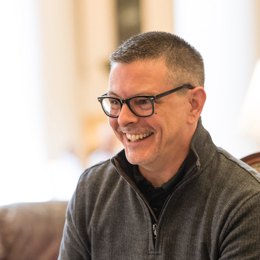 Employees, such as Andy Hesson, Assistant Vice President, contribute to our caring culture through which our employees work together to identify new and challenging growth opportunities that start with aspirational strategic plans. Our employees are the engines driving our strategic growth and they energize the Company to reach new heights. Investing in our teams is essential to the long-term growth of our Company. To reinforce this strategy, we launched a companywide educational and professional development corporate university, New Heights University. In 2017, New Heights University introduced the Aspiring Leaders Academy, a unique development program that blends classroom sessions and independent assignments into an immersive learning experience for the development of current and future leaders. 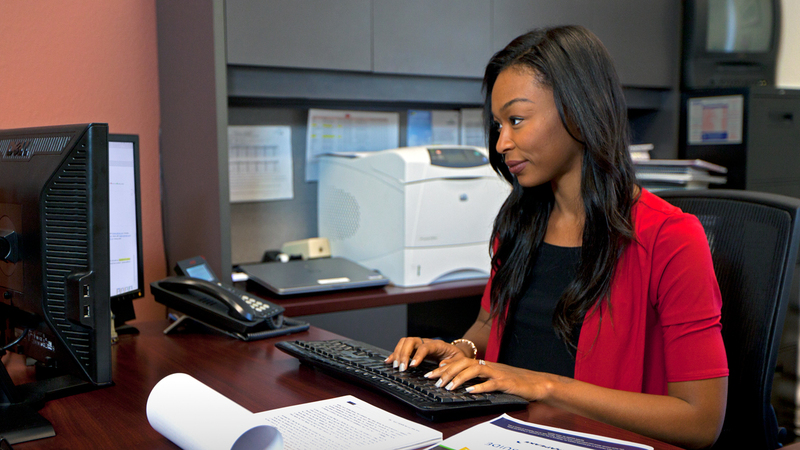 Our Chesapeake Wellness program encourages a healthier lifestyle by supporting our employees’ wellness efforts. 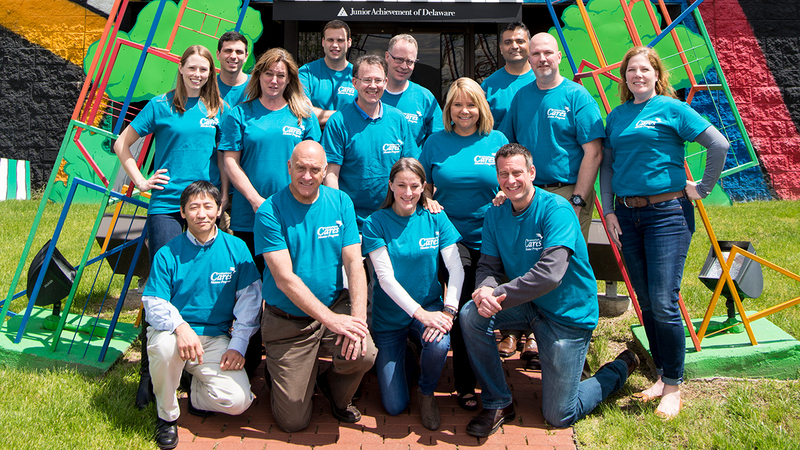 Aligned with the program, our employees participated in community runs and walks. 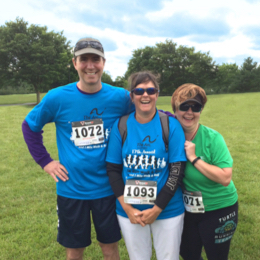 Bill O’Brien, Associate General Counsel; Heidi Zanecosky, Manager, Corporate Governance; and Arleen Murchison, Accounting Specialist II, at one of the many community races available to our employees. 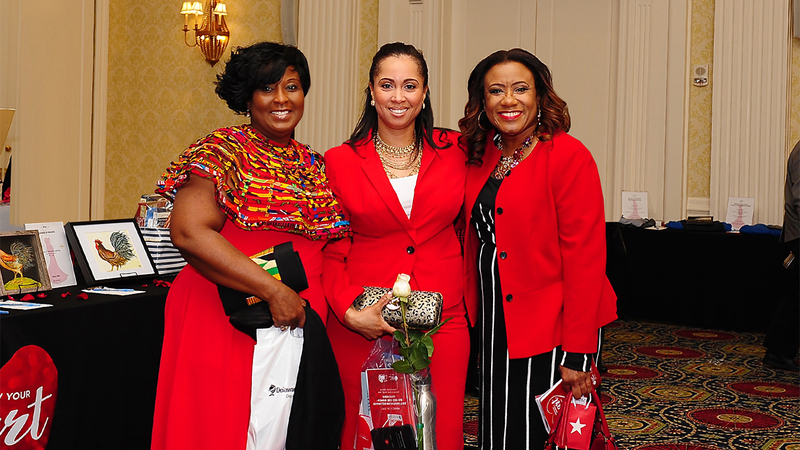 Pictured left to right: Connie Osei, Executive Assistant; Kisha Brown, Manager, Operations Analysis; and Nicole Carter, Assistant Vice President, Customer Care, wear red in support of the American Heart Association’s Southern Delaware Go Red For Women® Luncheon. Chesapeake employees helped with the fundraising and planning for the luncheon in support of women’s health. 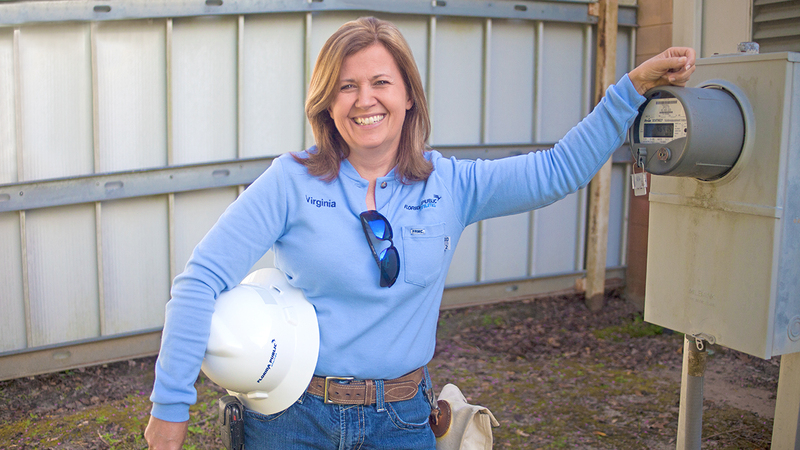 Senior Meter Reader Virginia Nail represents the Company’s commitment to celebrating and encouraging women to consider careers in energy. 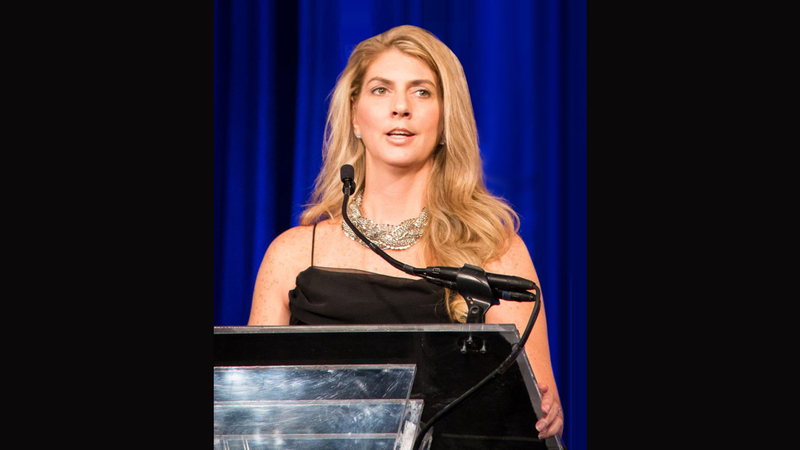 Stacie Roberts, Director of Corporate Governance, at the Corporate Secretary magazine awards ceremony. During International Women’s Day and Women's History Month, we honored our female colleagues through a “Women in Energy” campaign that highlighted their expertise, dedication and successes within the industry and our Company. 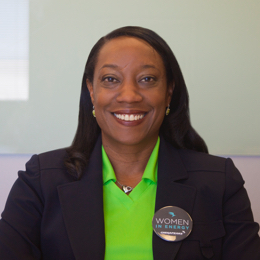 Dina Bellechases, Human Resources Generalist I, joins the Company in celebrating "Women in Energy" at Chesapeake, commending our female colleagues for their contributions to the Company’s long-term growth. Our Corporate Governance team was recognized by Corporate Secretary Magazine as the 2017 Corporate Governance Team of the Year for small to mid-cap sized companies. This is the third year that the Company has been recognized by the magazine for its outstanding Corporate Governance practices, and the second time it has taken top honors. Chesapeake received four 2017 International iNOVA Awards for four videos highlighting our employees’ commitment to the community. The award-winning videos focused on Chesapeake’s company culture, participation in our Chesapeake Cares Mentor program, and leadership and partnerships with the Food Bank of Delaware and Go Red for Women®. The Southern Gas Association recognized FPU with a Marketing Excellence - Member’s Choice Award for its “Natural Gas Spring Showers” campaign. The program encouraged FPU customers to apply for substantial natural gas rebates on eligible appliances, such as hot water heaters, to help offset appliance costs. Chesapeake Utilities was named 2017 Kent County Tourism Partner of the Year in recognition of its collaboration in creating a positive environmental impact and advancing tourism within Kent County, DE. Aspire Energy received a commendation from the office of Governor John R. Kasich, on behalf of the state of Ohio. In recognition for “outstanding volunteer services” to the community, People to People Ministries nominated Aspire Energy for supporting programs, including their back to school and holiday collections, throughout the year. For the second consecutive year, Sharp Energy received awards for “Best Gas Company of the Eastern Shore” and “Best Southern Delaware Gas Company – Sussex County” as chosen by the readers of The Metropolitan Magazine. 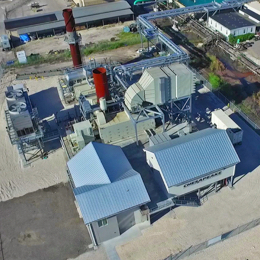 The Southeastern Electric Exchange, Inc. named the Eight Flags Energy Combined Heat and Power (CHP) Plant a 2017 Industry Excellence Award winner in the Production category. The award recognizes projects that demonstrate innovation, improvements and technical complexity. FPU received the Southern Gas Association’s Engineering Innovation Award in recognition of the inventive engineering, design and business model used in the development of the Eight Flags Energy CHP Plant. The innovative project lowered electric costs for customers, enhanced system reliability, created economic benefits for the community and had a positive impact on the environment. For the sixth consecutive year, Chesapeake Utilities Corporation was honored to receive the Top Workplace Award. This recognition is a reflection of our strong culture, engagement and the commitment of our employees who work together to achieve success. Safety is a top priority for our Company. Over the last 15 years, our businesses in Delaware, Maryland and Florida have been recognized with 22 Safety Achievement Awards from the American Gas Association. 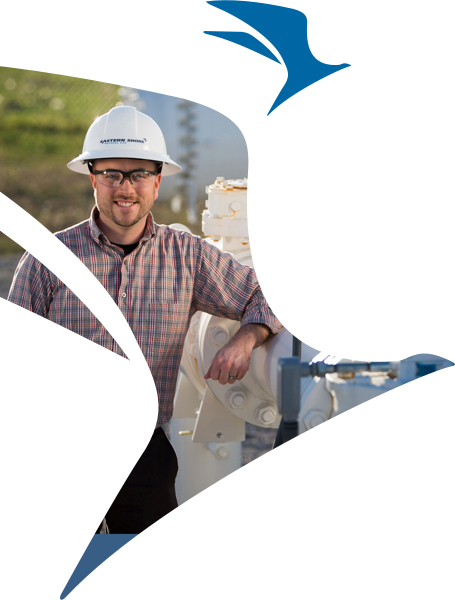 Chesapeake strives to provide our employees with opportunities to increase their service to our communities. Kicking off 2017 with a companywide campaign supporting the United Way, Chesapeake employees pledged over $80,000. For the sixth year, Chesapeake volunteers brought their energy and enthusiasm to the Food Bank of Delaware’s warehouse facility where they packaged holiday meals to distribute to families on the Delmarva Peninsula as part of our “Thanksgiving For All” program. From left: Becca Grier, Operations Assistant II; Avonel Rodriguez, Accountant III; Dave Detrick, Manager, Commercial and Industrial Accounts; and Crystal Waples, Service Coordinator. More than 350 employees from across the Company packaged and delivered Thanksgiving meals for families in need. Sharp Energy partnered with the Delaware Transit Corporation to “stuff a bus” with Thanksgiving food items that were distributed through the Food Bank of Delaware. Employees packed kid-friendly, nutritious meals to be put into backpacks for children in need, and sorted produce and canned goods for local food banks. Through our companywide Chesapeake Cares Mentor program, employees make a positive impact on students’ lives by offering encouragement and guidance. Our mentoring partners include Connecting Generations and Junior Achievement. View our mentors in action at chpk.com/mentor2017. Pictured: Vince Fiorelli, Sales Representative, has been a mentor to his mentee for six consecutive years. 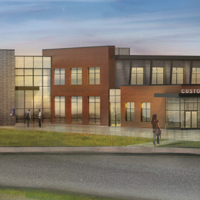 Chesapeake Utilities supported the construction of the Boys & Girls Clubs’ new 75,000-square-foot multi-use facility in Dover, DE, which provides a safe and friendly atmosphere for children to meet and play. 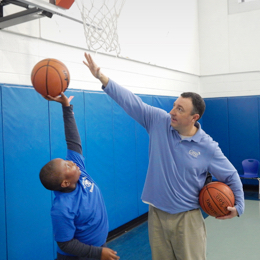 With the new facility, the Boys & Girls Clubs were able to increase the number of youth served. We harness the power of our collective efforts to create a larger impact in our communities through our companywide Cares With a Cause program. Each quarter, we select a different charitable cause to support through donations of time, money or goods. The Chesapeake Aspiring Scholars program awarded scholarship grants to students of our employees in support of their educational pursuits at colleges, universities and technical schools for the 2017-2018 school year. This annual program is open to high school seniors of employees across the Company. Al Gallo, (front row, far right) Assistant Vice President and board member for Junior Achievement of Delaware; and the PESCO team dedicate time to mentoring students through our Chesapeake Cares Mentor program. In front of the Games Room sponsored by Chesapeake Utilities are Michael P. McMasters, President and CEO, (left); and Darrell Tingle, Regional Resource Development Director for Boys & Girls Clubs of Greater Dover. Chesapeake is committed to increasing the availability and convenience of the Sharing program, which provides funds for families with financial needs. Pictured: Crystal Waples, Service Coordinator. Andy Hesson, Assistant Vice President; Ed Hudson, Delivery Driver; Suzy Hutchison, Manager, Customer Experience; Mandie Granger, District Manager; and Bob Zola, President of Sharp Energy, with the Nemours Charity Bobtail. Crystal Campbell, Marketing Coordinator, was part of the team that connected with FPU’s customers and community members through social media during Hurricane Irma. 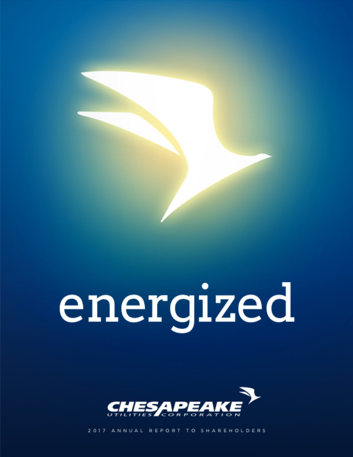 The Chesapeake Emergency Energy Recipient Program, or Chesapeake SHARING, assists Delaware and Maryland customers who are unable to pay their natural gas or propane heating bills due to financial hardship. The purchase or repair of appliances also qualifies for individual grants. Chesapeake funds the SHARING program with donations provided by Chesapeake Utilities, Sharp Energy, and their employees, customers and other members of the community. 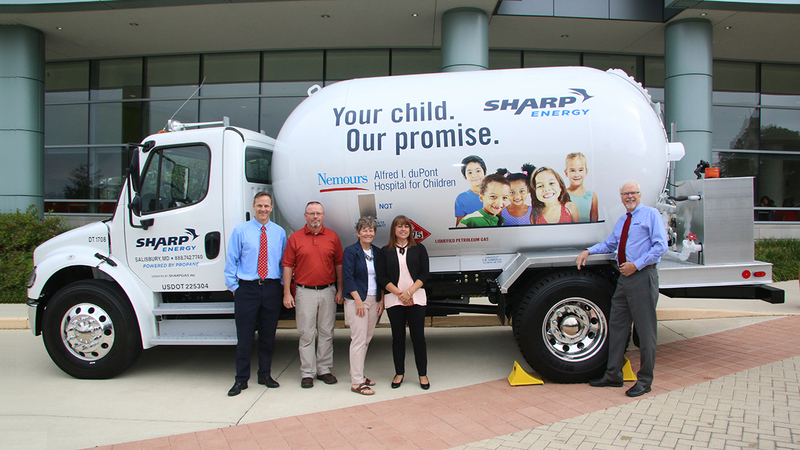 Sharp Energy is partnering with The Nemours Alfred I. duPont Hospital for Children, which is currently under construction, by making a contribution to the hospital for each gallon of propane that Sharp Energy delivers to its customers with the Nemours Charity Bobtail. Once the hospital opens its doors in the first quarter of 2019, Sharp Energy employees will also donate their time and energy in support of The Nemours Alfred I. duPont Hospital for Children. The Hurricane Irma electric restoration effort was the largest restoration event that the U.S. has experienced. After the first 48 hours, FPU had restored power to over 70 percent of the Island’s customers. Our team worked nonstop to have all power restored within 100 hours. Our propane team went above and beyond to keep customers throughout Florida up and running and even provided deliveries for other propane suppliers who could not meet their customers’ needs. "We are engaging our customers, communities and governments with our strong support of the conservation and protection of our natural resources." – Steve Thompson, Senior Vice President and a board member of the Delaware Chapter of The Nature Conservancy. Kathryn Marro, Philanthropy & Donor Relations Coordinator for The Nature Conservancy. We provide environmentally-friendly alternative fuels for vehicles, including compressed natural gas (CNG) and propane AutoGas, to reduce emissions in transportation applications. Chesapeake Utilities teamed up with Kent County Tourism on the Tourism office’s new CNG-fueled mobile visitor center, The Villager. Pictured: Frank Wildermuth, Conversion Coordinator. Over the past 10 years, Chesapeake Utilities and Sharp Energy have worked with Delaware’s Clean Cities Coalition to improve air quality and increase the use of cleaner fuels in transportation. Currently, we are partnering with the coalition on the distribution of parking signs that read “Preferred Parking for Alternative Fuel Vehicles” in support of developing a Clean Fuel Corridor in Delaware. Our new Energy Lane Campus, which will accommodate approximately 250 employees in Dover, DE, will feature the Company’s new CNG fueling station for public use on the Delmarva Peninsula. In addition to the station in Dover, we added four more CNG vehicles to our fleet and upgraded our private CNG station in Salisbury, MD with more fill connection points. The station also provides CNG for system operational uses. Pictured left to right: Shane Breakie, Director, Energy Services; Josh Leager, Meter Technician II; Jason Scott, Designer I; Eric Mays, Director, Marketing; Dave Detrick, Manager, Commercial and Industrial Accounts; and Rick Wunsch, Manager, Field Operations. Scott Turner, Manager, Operations, discusses Sharp Energy’s AutoGas initiative with U.S. Senator Tom Carper. 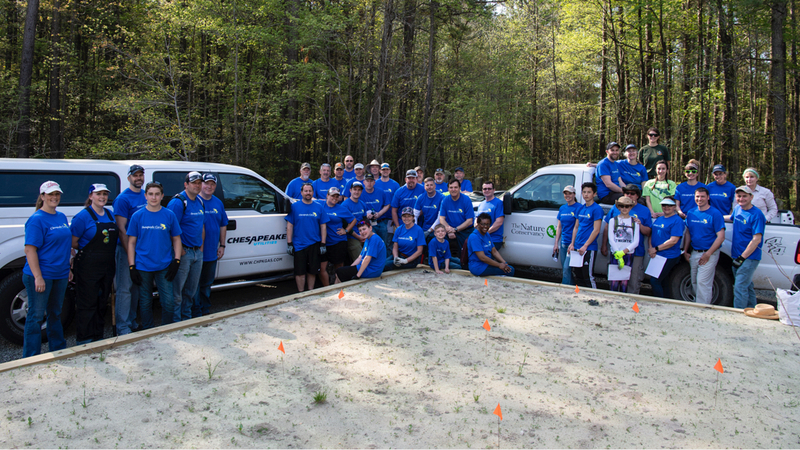 The Chesapeake team assisted the Delaware Nature Conservancy by planting trees and shrubs in their newly constructed parking lot, and spruced up the grounds for future visitors ready to learn about nature and the local environment. Steve Farkas, Director, Integrity Management & Compliance, enjoys giving his time to Chesapeake’s outdoor volunteer opportunities. Tom Kosikowski, Senior Data Analyst; Amanda Chi, Director, Business Planning; and Mike Scher, Manager, Customer Care-Back Office – Collections, work at mulching the Delaware Nature Conservancy property. 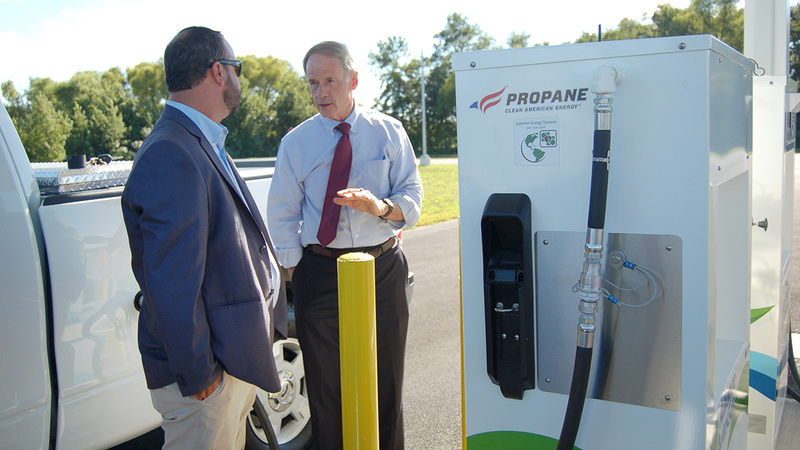 The new Sharp AutoGas fueling station near the Baltimore- Washington International Airport is the latest addition to the Company’s network of 42 propane fueling stations, servicing airport shuttles, school bus companies and commercial fleets. Our Chesapeake family of businesses continue to work together to invest in our energy infrastructure. We strive to deliver safe and outstanding service while extending our service territories and entering new markets to enhance our ability to grow and meet our customers’ needs. Eastern Shore Natural Gas Company constructs a major pipeline expansion. The 2017 Expansion Project is the single largest expansion in ESNG’s history. More than $117 million is being invested in ESNG’s natural gas interstate pipeline system in order to provide more than 60,000 dekatherms per day of additional firm natural gas service to meet the growing energy needs of the Mid-Atlantic region. 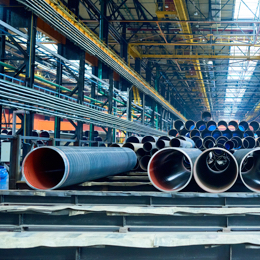 6 million gallons is the annual wholesale throughput capability due to Sharp Energy completing its North Dover Rail Plant project in Dover, DE, and construction of its bulk storage plant in Anne Arundel County to serve the western shore of Maryland. The dramatic increase is attributable to Sharp AutoGas’ strong reputation as a premier provider, its strategic focus on converting school buses to propane AutoGas and its alliances with conversion manufacturers. 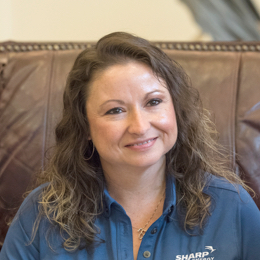 Marcy Robbins, Manager, Energy Distribution, is part of the Sharp Energy team who led the upgrade of the North Dover Rail Plant project that increases the availability of our propane supply to growing markets in Delaware, Maryland and Pennsylvania. 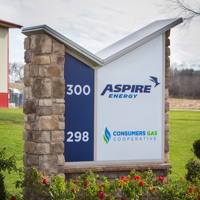 Aspire Energy enhanced its services to its expanding markets in Ohio with the addition of 51 miles of new pipeline mains for gathering services and deliveries, and the completion of a new office and warehouse facility in southern Ohio. Aspire Energy achieved nearly a 20 percent year-over-year increase in gross margin through diligent growth and expansion efforts, additional services to customers and favorable pricing amendments to long- term gas sales agreements. To support its growth and expansion efforts, Aspire Energy invested in personnel and resources, improving the bench strength and talents of its team and leadership group. Chris Hines, Systems Operations Administrator, and his colleagues from Aspire Energy achieved growth goals and enhanced operational performance in 2017. 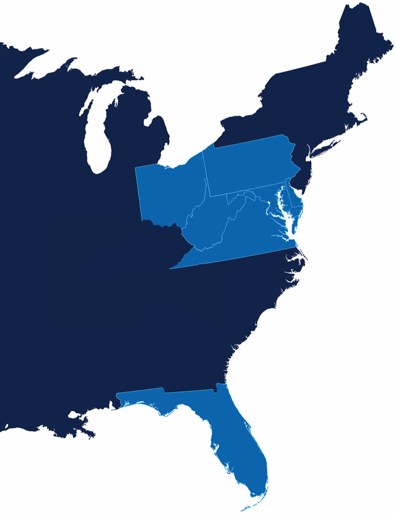 PESCO experienced significant growth in 2017 by entering new marketing territories and expanding its energy marketing reach in the Mid-Atlantic, Southeast and Midwest. PESCO also complemented its current portfolio by acquiring certain commercial and industrial marketing assets specifically located in western Pennsylvania. These accomplishments helped PESCO execute on its strategic plan to aggregate supply, increase market demand and optimize its natural gas assets. PESCO realized over 73 percent gross margin growth in 2017. Marissa Stipa, Director of Optimization, contributes to our PESCO team of energized professionals who have an average of 20 years in the industry and use this experience to create thoughtful and customized solutions for customers. 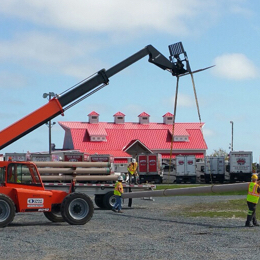 In 2017, Sandpiper Energy brought natural gas service to the town of Ocean City, MD as part of the Company’s ongoing initiatives to increase energy options for residents. 3,500+ tons of CO2 emissions will be eliminated when the Ocean City system fully converts to natural gas – the equivalent of 600+ cars being taken off the road. 5,800 homes and businesses in Worcester County, MD have been converted by the Sandpiper Energy team since 2013. 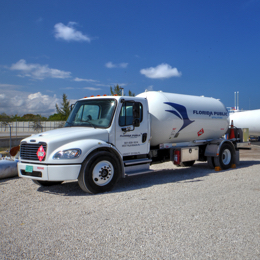 Through the $40M pipeline project project, three of our businesses – Peninsula Pipeline, FPU and Chesapeake Utilities’ Florida Division – are working together to provide additional transportation and delivery services to municipal utilities and industrial customers that will increase the Company’s footprint in northwest Florida. Our natural gas-fired Eight Flags Energy CHP Plant located on Amelia Island, FL (left) completed its first year of operations in 2017. It generates approximately 21 megawatts of base load power, producing enough electricity to meet on average 50 percent of the Island’s demand. The plant produces three energy outputs: steam, heated water and electricity. FPU purchases the electricity for distribution to its electric customers. A customer adjacent to the CHP plant purchases the steam and heated water for use in its production facility. Chesapeake Utilities is providing natural gas to power a three megawatt CHP plant at Peninsula Regional Medical Center in Salisbury, MD. Maryland Governor Larry Hogan attended the commissioning event where he spoke about the economic and environmental benefits of the CHP plant. This is the third CHP gas supply project that Chesapeake Utilities has implemented throughout the Delmarva Peninsula as a result of its commitment to providing valuable energy options to our customers. Mary Beth Tung, Maryland Energy Administration Director; Roger Follebout, Jr., Community Relations Director at Peninsula Regional Medical Center; and Maryland Governor Larry Hogan at the dedication of the medical center’s CHP plant. Chesapeake Utilities Corporation was incorporated in Delaware. Two natural gas companies, Citizens Gas Company, Salisbury, MD and Sussex Gas Company, Seaford, DE, were acquired. Eastern Shore Natural Gas Company, (ESNG) was incorporated in Delaware. 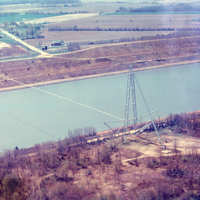 By 1966, ESNG extended a pipeline from Bridgeville, DE to Cambridge and Easton, MD. ESNG extended a pipeline from Parkesburg, PA to Salisbury, MD and began delivering gas to its customers in the region. 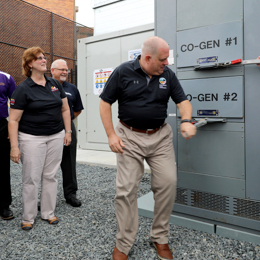 During this time, Chesapeake Utilities Corporation converted three operating facilities from propane to natural gas. 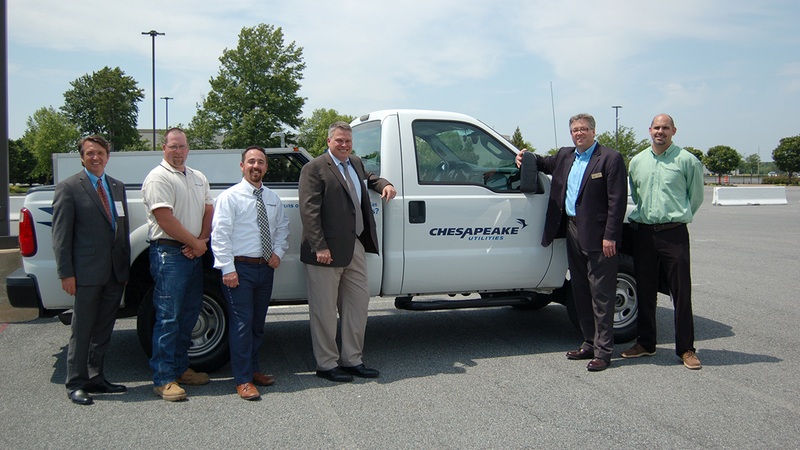 Chesapeake Utilities Corporation acquired its first propane company, Mitchell’s Gas Service, Laurel, DE. 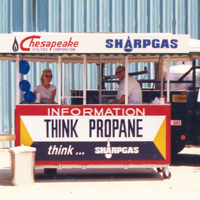 Clarence E. Sharp Company, Georgetown, DE, a propane distribution company, was acquired. Sharpgas, Inc., dba Sharp Energy, was formed to consolidate Chesapeake operations. Central Florida Gas Company, Winter Haven, FL, a natural gas distribution company, was acquired. Chesapeake Utilities Corporation’s common stock began trading on the NASDAQ National Market System. 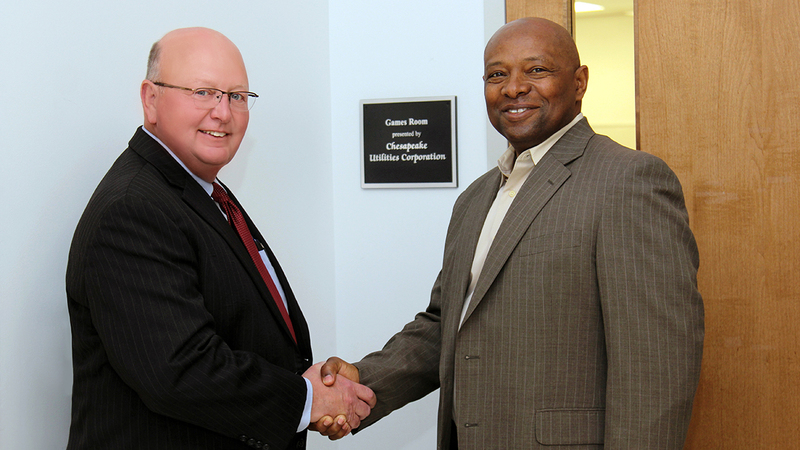 Cambridge Gas Company, Cambridge, MD, a natural gas distribution company, was acquired. Plant City Natural Gas Company, Plant City, FL, a natural gas distribution company, and Kellam Energy Inc., Belle Haven, VA, a propane and oil products distribution company, were both acquired. 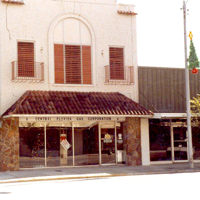 Chesapeake Utilities Corporation began trading on the NYSE as CPK. Central Florida Gas Company’s service territory expanded to include Gadsden and Citrus Counties. The Company completed the acquisition of Florida Public Utilities Company. The Company purchased the operating assets of Eastern Shore Gas, now operating as Sandpiper Energy, Inc., to provide service to customers in Worcester County, MD on the Delmarva Peninsula. The Company completed the merger of Gatherco, Inc. into Aspire Energy of Ohio, LLC, providing natural gas midstream services, processing and transportation services to over 300 producers, and wholesale natural gas supply to over 20,000 end users in Ohio. 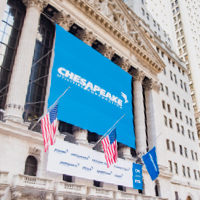 Chesapeake rings The Closing Bell® at the NYSE. 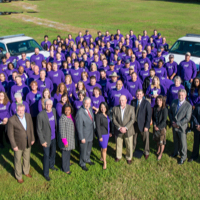 Chesapeake Utilities Corporation celebrates its 70th anniversary of incorporation. The Company completed the acquisition of natural gas marketing assets in Pennsylvania. Chesapeake opens the Energy Lane Campus, in Dover, DE – the largest single location in the Company’s history – to accommodate our natural gas transmission and distribution operations in Delaware.